Nanas and Beans and Heads, oh my! | Taino Woman Comes Dancing...in the spirit of Hatuey! Nanas and Beans and Heads, oh my! Again, I received a response regarding my thoughts on the topic of Afrocentrism. These were posted in the comment section of the essay titled They came before Columbus…and what?!? . Because these questions are valid and others may have them as well, I sought to respond via email as well as in essay form. I read Van Sertima’s books, They came before Columbus and Early America Revisited. I not only read them, I studied them with a critical mind. I analyzed them with the desire to believe, but his words just didn’t hold up to scrutiny. Please notice that my disagreement with Van Sertima is not with regards to the idea of pre-Columbian intercontinental travel. That makes complete sense to me. Hawaii is about 3,800 miles from Guam and Guam is about 1,500 miles from the Philipines. The Maori (New Zeland/Aotearoa) have an oral history that links them to Hawai’i and these islands are over 4,000 miles apart. The indigenous population in these islands have been present for thousands of years before the Europeans even dared travel out of land-sight distance and I’m sure they didn’t swim there. Just because scientists don’t believe in ancient man’s intelligence and ingenuity doesn’t mean they didn’t have it; it’s what has brought us to the technological levels we enjoy today. My disagreement with Van Sertima is based on his far-fetched conclusions accrediting indigenous American progress to African influence based only on the opinion of African superiority and nothing else, because what he presents as “evidence” doesn’t hold water. And although he says his intention is not to demean the indigenous population of the Americas, his words and their implications say otherwise. On page 138 of Early America Revisited, Van Sertima HIMSELF refutes the claim that he ever credited the bottle gourd to Old World Voyagers. “I was at pains to point out that this is one plant that could drift to America without the loss of seed viability.” However, confusion is understandable. I’ve observed that, although in a subtle manner, Van Sertima contradicts his own statements. Speaking, as he accuses Stephens of doing on that same page, with a forked tongue. As for the bananas, a fruit originating from Asia, we have historical accounts where the Spanish (Oviedo) clearly state that they were the ones to have brought the banana to the Caribbean. That should be the end of it. If Afrocentric historical revisionism will have us depend on the writings of these same Spanish chroniclers as having seen “black” people in South America, why are we to dispute their claim to the importation of the banana? Writings from 500 years ago cannot be discounted with the modern “racist agenda in academia” excuse. Yet, wanting to bolster his position, Van Sertima then introduces reports of pre-Columbian peruvian grave site findings of ritualistic offerings to the dead. Oh, he does mention that these graves were tampered with and their grave contents renewed; “These people would open the tombs, renew the clothing and the food placed in them and in many instances… reinter them.” (They Came before Columbus, p. 197) but his wording implies that this all ceased immediately upon arrival of the Spanish. (They Came Before Columbus, p. 194, Early America Revisited, p. 187) With this false assumption, he claims “mysterious” and “unexplained” “medieval vintage” items, like bananas, found therein. How this bolsters his argument, when he also admits that these graves were tampered with to continue indigenous spiritual practices as well as the knowledge that Spanish arrival was during the Middle ages (the Modern Era is considered to have begun between the 1500-1800) makes no sense whatsoever, so confusion reigns. No self-respecting scientist would depend on movable evidence found on site as a dating tool under those conditions. Once there is knowledge that the site had been disturbed there is the possibility of contaminants that will cast a shadow of doubt onto the dating and make the scientist look inept. This is a standard to which some linguists have not bothered to hold themselves up to. If the author of the jackbean controversy himself states that his paper was suggestive and offered for further investigation, it would be incredibly irresponsible to offer it in an academic study such as this one, as conclusive. It’s deceitful, untrustworthy and incredibly irresponsible; particularly coming from a scholar. Consider that these huge carvings are artistic representations and not realistic images. The fact that they are completely out of proportion as compared to the natural thing should be the first indication of this. 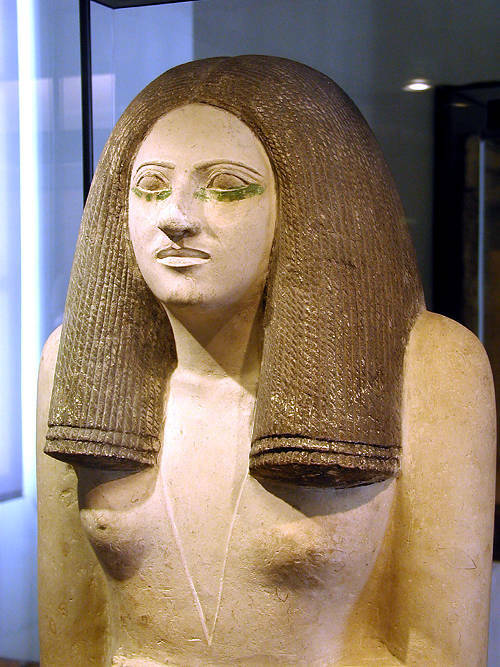 We don’t assume that Egyptian people were as they were depicted in their art: painted figures that are top-heavy, stiff-legged, just as disproportionate with heads resting upon their shoulders, as if they had no neck. Are we to think this is what Egyptians/Nubians/Africans really looked like then? 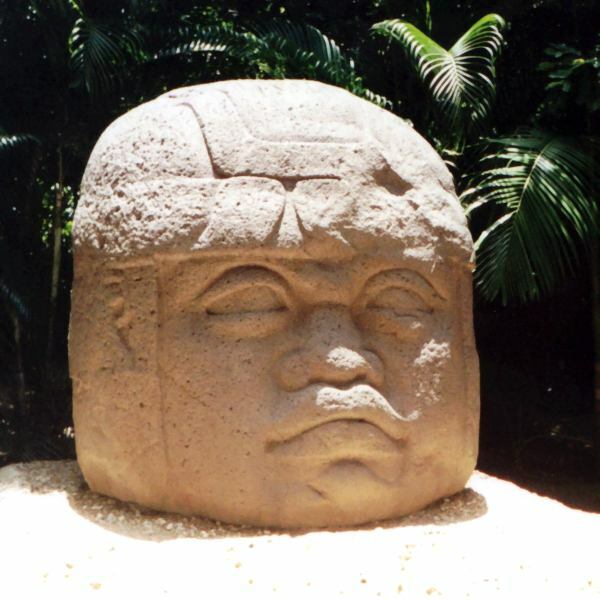 The Colossal Heads of the Olmec depict images that could look African, yes. But they also look native American and Asian, because they share some of the same stereotypical characteristics. If we were to believe the myth of “race” and attempt to define the Olmec Head presented below by racial characteristics, it looks a lot more mongolian than caucasian or negroid. Being that these heads exist only in the Americas and that the American continent has and still is populated by natives who look like that too, makes the thought that these carvings were to honor a people from 10-15,000 miles away seem more than a little ridiculous. Additionally, this “technique” of identification has more in common with racial profiling than it does with good scientific investigation. The biggest argument Van Sertima and other afrocentrics use to support their opinion that these Olmec heads are African is based on their looks. They supposedly represent black/African people because they “look” black; they have thick lips, and wide noses and in many instances they were either painted black or black materials were used. But no one has asked a very important question: what does a black person really look like? The continent of Africa, the cradle of humanity, has within it’s boundaries examples of all stereotypes, body structures and ranges of color (both the pygmies and the Sudanese are African). The African that Van Sertima claims came to the Americas (Nubian, Egyptian, East African) was of different features than the African people he compares to the megalithic heads (Benin, Nigeria, Ghana, West African), which is a sad deception taking advantage of those stuck on “skin color” issues, racism, discrimination and victim mentality or those who buy into the notion of racial profiling as good science. This colossal head is 2.4 m high (9 ft) and is officially known as Monument 1. 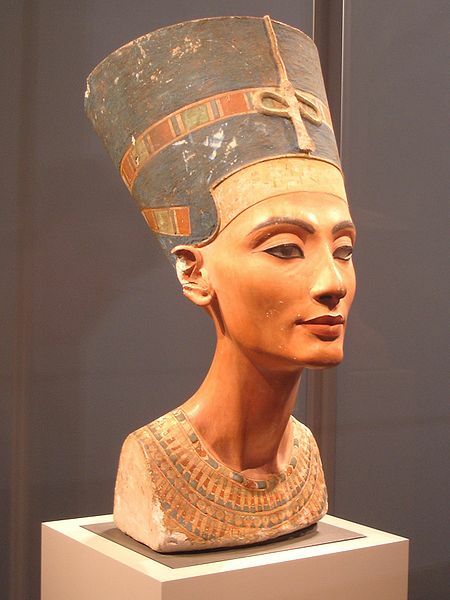 As a matter of a fact, using Afrocentric techniques, we can say that Nefertiti looks like an indigenous American Indian woman. Edward Malcowski, in his book Before the Pharaohs, claims that it was a Mayan queen who escaped social unrest in her country, sailed to Africa and taught the concept of civilization and dynasties to the Egyptians thousands of years before their first recorded living god-Pharaoh. According to Malkowski, she may have even been deified as Isis! Isis, an Egyptian Goddess, is actually a Mayan queen! Malkowski has the same kind of supportive evidence that Afrocentrics do: documentation from digs and scientific measurements as well as linguistic “proof” that is much more substantial than the indecipherable scratches that are used by the Afrocentric scholars. He even uses the same oceanic “conveyor belt” idea since it would just as easily transport indigenous American ships to Africa… He uses well known evidence showing that both continents had mummification utilizing same/similar techniques with the oldest mummies coming from the Chinchorro people in South America. Both cultures have pyramids, but the Americas is home to the largest and oldest pyramids in the world. (See the personal communication from Johnathan Haas shared by Salsassin in the comment dated Dec 3, 2009 in this post) Caral, in Peru, is 5,000 years old and it is NOT the oldest pyramidal structure in the Americas. Caral had an economy based on cotton agriculture and not only traded its product, but also made textiles; “fine cloth”, according to the documentary link above. That means weaving was present in the Americas 5,000 years ago, before the supposed arrival of the African “gods” and their wisdom. I wonder if this find will encourage Afrocentrics to change the supposed “American/African contact” date… again. Tiseti’s comment above, about these heads being representations of gods in the likeness of Africans, is an ethnocentric slur against indigenous Americans regarding our self-value in relation to the African. There is no greater position of authority, superiority, supremacy and preeminence than god-head. To believe that indigenous Americans would look to another people outside themselves to fashion the image of their god(s) is a supreme example of overwhelming arrogance. Anthropologists say that people imbue non-human aspects of their world with human qualities so as to be able to relate and understand these things better; so as to better make sense of their world. The spirits and gods then have characteristics that exist in themselves, not in another. The big picture includes a lot more than just the color of one’s skin. Racial division is a human construct, not a scientific one. In ancient days it was your caste that was important, not your color. To continue propagandizing a revised history based on a racial agenda is propagating racism and not good scholarly form. And to answer the question: Why would people make figures of gods that look like Africans if they never met each other? Because those figures do not look like Africans, they look like the people who lived there, the people who created them: indigenous American people. Possibility does not equate to occurrence. You still have to find evidence that Polynesians ever made it to the Americas. As for expansion, a better question to ask, I think, would be how the Polynesians got to those islands 2-3,000 years before the European expansion began if the Europeans were the first to travel such distances. The only evidence we have is of people being on these islands that far back, but not how they got there. The same way they expanded thousands of miles into the Pacific is the same way they expanded elsewhere. You are right when you say that possibility doesn’t equal occurrence, but lack of physical evidence doesn’t equal lack of occurrence either; especially when the people are there already. The Europeans didn’t find empty islands. A link to your essay They came before Columbus…and what?!? was left in my journal after I shared interest in the subject of Africans in the Americas pre-Columbus. As an African who holds a keen interest in history, I have to say I agree with most, if not all, of what you’ve written in both essays. Afrocentrists are wrong for trying to stake claims over other cultures. I find such claims not only full of holes and wrong but also disturbing. When Afrocentrists try to say every single civilisation built in history was thanks to Africans they are essentially doing what they accuse Europeans of doing i.e. whitewashing history. I am grateful that I was not introduced to Africa-Americas relations by Van Sertima. The book I read (When We Ruled) actually turned things the other way round 😀 by arguing that maize used in parts of West African originated from the Americas. Of course that has been met with opposition. Another point the author of that book made was that in ancient Ile-Ife, the ancient capital of Yorubaland, the streets were once paved in designs that seem indigenous American in style. The book also mentioned a 14th century king of Mali going on an expedition across the Atlantic and never returning. I find all this amazing and am currently trying to find out more on the topic. The question of evidence is very tricky for several reasons, so many things have been lost in time and I firmly believe that certain histories are pushed aside and under-reasearched which means we never know about them. My disagreement with Van Sertima is based on his far-fetched conclusions accrediting indigenous American progress to African influence based only on the opinion of African superiority and nothing else, because what he presents as “evidence” doesn’t hold water. I find Van Sertima’s conclusions beyond offensive. I don’t understand why he would try to suggest that Africans influenced indigenous Americans so much. Why not just provide evidence, if there is any, that is not based on any superiority. For example, I’m interesting in knowing if there was some exchange that happened between continents on an equal basis. Consider that these huge carvings are artistic representations and not realistic images. I personally believe this is something everyone should have in mind when looking at historical sculptures. It reminds of essays arguing that Buddha looks African based on some statues! It was after reading those essays that I moved away from staunchly Afrocentric versions of history. I agree with you when you say it is revisionism. The African that Van Sertima claims came to the Americas (Nubian, Egyptian, East African) was of different features than the African people he compares to the megalithic heads (Benin, Nigeria, Ghana, West African), which is a sad deception taking advantage of those stuck on “skin color” issues, racism, discrimination and victim mentality or those who buy into the notion of racial profiling as good science. In ancient days it was your caste that was important, not your color. Ditto. Race did not exist back then. Black people today who do not know much about our history and feel that African achievement has been pushed to the side are interested in the history of Africans and Black people. However there is always a middle path, taking things to the extreme and blowing African achievement out of proportion is just inexcusable. This post and the previous one are truly excellent. Your essays were eye-opening and also jaw-dropping (I had no idea about the pyramids and mummification! if Isis was actually a Mayan queen that’ll be so interesting) Thank you for writing them. We are of a mind when speaking of history. The conquering culture gains nothing by allowing the conquered to express their point of view and all too often items that would hold significant value and information for future generations are destroyed as part of the colonization process. We are working from some very limited pools of information. Added to this is the fallacy of taking history at face value and overlooking some very important details; mainly that history is an opinion, usually written by someone who wasn’t there, who is commonly a member of the conquering culture and will write in a way that either justifies the actions of their ancestors, regardless of how heinous they may have been, or glosses over the worst of it. And, although we live in very “modern” and “sophisticated” times, the reality of racism and the lack of value given to “certain histories” cannot be overlooked. I also agree when you say that “blowing African achievement out of proportion is inexcusable”, however, you mention something else that is, in my opinion, very important; that Afrocentrics are “essentially doing what they accuse Europeans of doing”. What I have learned through readings in psychology as well as what I have lived in personal experience and observation, has been that dysfunctional and abusive patterns become inter-generational and will be perpetuated unless a conscious decision is made to change it. Fact is that we, as conquered people, have been lied to and imposed upon for so long, and very often in such a brutal manner, that the continuation of the pattern is not surprising. But hope springs eternal, and I believe that by dissecting the information we do have, seeking further knowledge and being open to the possibilities, we can overcome these patterns of behavior and find some measure of “truth”. I, for one, would rather have a distasteful truth than a pretty lie, any day of the week.